Although the cycle of the time after Pentecost has shown us many times already the solicitude of the Holy Spirit for the defense of the Church, yet today the teaching shines forth with a new luster. In the sixteen century Satan made a formidable attack upon the holy city by means of a man who, like himself, had fallen from the height of heaven, a man prevented in early years by the choice graces which lead to perfection, yet unable in an evil day to resist the spirit of revolt. As Lucifer aimed at being equal to God, Luther set himself up against the Vicar of God, on the mountain of the covenant; and soon, falling from abyss to abyss, he drew after him the third part of the stars of the firmament of holy Church. How terrible is that mysterious law whereby the fallen creature, be he man or Angel, is allowed to keep the same ruling power for evil, which he would otherwise have exercised for good. But the designs of Eternal Wisdom are never frustrated: against the misused liberty of the Angel or man, is set up that other merciful law of substitution, by which St. Michael was the first to benefit. The development of Ignatius’ vocation to holiness, followed step by step the defection of Luther. In the Spring of 1521 Luther had just quit Worms and was defying the world from the Castle of Wartburg, when Ignatius received at Pampeluna the wound which was the occasion of his leaving the world and retiring at Manresa. Valiant as his noble ancestors, he felt within him from his earliest years the warlike ardor which they had shown on the battlefields of Spain. But the campaign against the Moors closed at the very time of his birth (1491). Were his chivalrous instincts to be satisfied with petty political quarrels? The only true King worthy of his great soul revealed himself to him in the trial which put a stop to his worldly projects: a new warfare was opened out to his ambition; another crusade was begun; and in the year 1522, from the mountains of Catalonia to those of Thuringia, was developed that divine strategy of which the Angels alone knew the secret. In this wonderful campaign it seemed that hell was allowed to take the initiative, while heaven was content to look on, only taking care to make grace abound the more, where iniquity strove to abound. As in the previous year Ignatius received his first call three weeks after Luther had completed his rebellion, so in this year, at three weeks’ distance, the rival camps of hell and heaven each chose and equipped its leader. Ten months of diabolical manifestations prepared Satan’s lieutenant, in the place of his forced retreat, which he called his Patmos; and on the 5th of March the deserter of the altar and of the cloister left Wartburg. On the 25th of the same month, the glorious night of the Incarnation, the brilliant soldier in the armies of the Catholic kingdom, the descendant of the families of Ognes and Loyola, clad in sackcloth, the uniform of poverty, to indicate his new projects, watched his arms in prayer at Montserrat; then hanging up his trusty sword at Mary’s altar, he went forth to make trial of his future combats by a merciless war against himself. In opposition to the already proudly floating standard of the free-thinkers, he displayed upon his own this simple device: To the greater glory of God! At Paris, where Calvin was secretly recruiting the future Huguenots, Ignatius, in the name of the God of armies, organized his vanguard, which he destined to cover the march of the Christian army, to lead the way, to bear the brunt, to deal the first blows. On the 15th of August, 1534, five months after the rupture of England from the Holy See, these first soldiers sealed at Montmartre the definitive engagement which they were afterwards to solemnly renew at St. Paul’s outside the Walls. For Rome was to be the rallying place of the little troop which was soon to incease so wonderfully, and which was, by its special profession, to be ever in readiness, at the least sign from the Head of the Church, to exercise its zeal in whatever part of the world he should think fit, in the defense or propagation of the faith, or for the progress of souls in doctrine and Christian life. All the more touching, then, was the charming simplicity of those first Fathers of the Society, making their way to Rome on foot, fasting and weary, but their hearts overflowing with joy, singing with a low voice the Psalms of David. When it became necessary, on account of the urgency of the times, for the new institute to abandon the great traditions of public prayer, it was a sacrifice to several of these souls; Mary could not give way to Martha without a struggle; for so many centuries, the solemn celebration of the Divine Office had been the indispensable duty of every religious family, its primary social debt, and the principal nourishment of the individual holiness of its members. But new times had come, times of decadence and ruin, calling for an exception as extraordinary as it was grievous to the brave company that was risking its existence amid ceaseless alarms and continual sallies upon hostile territory. Ignatius understood this; and to the special aim imposed upon him, he sacrificed his personal attraction for the sacred chants; nevertheless, to the end of his life, the least note of the Psalmody falling on his ears drew tears of ecstasy from his eyes. 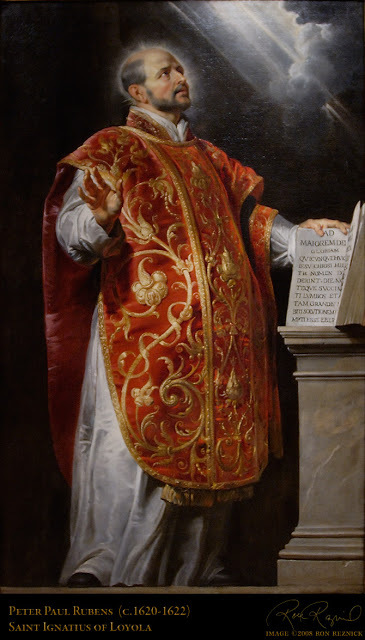 After his death, the Church, which had never known any interest to outbalance the splendor of worship due to her Spouse, wished to return from a derogation which so deeply wounded the dearest instincts of her bridal heart; Paul IV revoked it absolutely, but St. Pius V, after combating it for a long time, was at last obliged to give in. In the latter ages so full of snares, the time had come for the Church to organize special armies. But while it became more and more impossible to expect from these worthy troops, continually taken up with outside combats, the habits of those who dwelt in security, protected by the ancient towers of the holy city, at the same time Ignatius repudiated the strange misconception which would try to reform the Christian people according to this enforced but abnormal manner of life. The third of the eighteen rules which he gives as the crowning of the Spiritual Exercises, to have in us the true sentiments of the orthodox Church, recommends to the faithful the chants of the Church, the Psalms, and the different Canonical Hours at their appointed times. And at the beginning of this book, which is the treasure of the Society of Jesus, where he mentions the conditions for drawing the greatest fruit from the Exercises, he ordains in his twentieth annotation that he who can do so, should choose for the time of his retreat a dwelling from whence he can easily go to Matins and Vespers as well as to the Holy Sacrifice. What was our Saint here doing, but advising that the Exercises should be practiced in the same spirit in which they were composed in that blessed retreat of Manresa, where the daily attendance at solemn Mass and the evening Offices had been to him the source of heavenly delights? But it is time to listen to the Church’s account of the life of this great servant of God. Ignatius natione Hispanus, nobili genere, Loyolæ in Cantabria natus, primo catholici regis aulam, deinde militiam secutus est. In propugnatione Pampelonensi accepto vulnere graviter decumbens, ex fortuita piorum librorum lectione, ad Christi sanctorumque sectanda vestigia mirabiliter exarsit. Ad montem Serratum profectus, ante aram beatæ Virginis suspensis armis, noctem excubans, sacræ militiæ tyrocinium posuit. Inde, ut erat indutus sacco, traditis antea mendico pretiosis vestibus, Manresam secessit: ubi emendicato pane et aqua victitans, exceptisque diebus Dominicis jejunans, aspera catena cilicioque carnem domans, humi cubans, et ferreis se flagellis cruentans, per annum commoratus est: claris adeo illustrationibus a Deo recreatus, ut postea dicere solitus sit: Si sacræ Litteræ non exstarent, se tamen pro fide mori paratum ex iis solu, quæ sibi Manresæ patefecerat Dominus. Quo tempore homo litterarum plane rudis admirabilem illum composuit Exercitiorum librum, Sedis Apostolicæ judicio et omnium utilitate comprobatum. Ignatius, by nation a Spaniard, was born of a noble family at Loyola, in Cantabria. At first, he attended the court of the Catholic king, and later on, embraced a military career. Having been wounded at the siege of Pampeluna, he chanced in his illness to read some pious books, which kindled in his soul a wonderful eagerness to follow in the footsteps of Christ and the Saints. He went to Montserrat, and hung up his arms before the Altar of the Blessed Virgin; he then watched the whole night in prayer, and thus entered upon his knighthood in the Army of Christ. Next he retired to Manresa, dressed as he was in sackcloth, for he had a short time before given his costly garments to a beggar. Here he stayed for a year, and during that time he lived on bread and water, given to him in alms; he fasted every day except Sunday, subdued his flesh with a sharp chain and a hairshirt, slept on the ground, and scourged himself with iron disciplines. God favored and refreshed him with such wonderful spiritual lights that afterwards he was wont to say, that even if the sacred Scriptures did not exist, he would be ready to die for the faith, on account of those revelations alone which the Lord had made to him at Manresa. It was at this time that he, a man without education, composed that admirable book of the Exercises, which has been approved by the judgment of the Apostolic See, and by the benefit reaped from it by all. Ut vero se ad animarum lucra rite formaret, subsidium litterarum, a grammatica inter pueros exorsus, adhibere statuit. Cumque nihil interim omitteret de studio alienæ salutis, mirum est, quas ubique locorum ærumnas ac ludibria devoraverit, asperrima quæque, et vincula, et verbera pene ad mortem usque perpessus: quibus tamen longe plura pro Domini sui gloria semper expetebat. Lutetiæ Parisiorum adjunctis sibi ex illa academia variarum nationum sociis novem, quiomnes artium magisteriis et theologiæ gradibus insignes erant, ibidem in monte Martyrum prima Ordinis fundamenta jecit: quem postea Romæ instituens, ad tria consueta quarto addito de Missionibus voto, Sedi Apostolicæ arctius adstrinxit: et Paulus Tertius primo recepit confirmavitque: mox alii Pontifices ac Tridentina synodus probavere. Ipse autem, misso ad prædicandum Indis Evangelium sancto Francisco Xaverio, aliisque in alias mundi plagas ad religionem propagandam disseminatis, ethnicæ superstitioni hæresique bellum indixit, eo successu continuatum, ut constans fuerit omnium sensus, etiam Pontificio confirmatus oraculo, Deum sicut alios aliis temporibus, sanctoc viros, ita Luthero, ejusdemque temporis hæreticis, Ignatium et institutam ab eo Societatem objecisse. However, in order to make himself more fit for gaining souls, he determined to procure the advantages of education, and began by studying grammar among children. Meanwhile he relaxed nothing of his zeal for the salvation of others, and it is marvelous what sufferings and insults he patiently endured in every place, undergoing the hardest trials, even imprisonment and stripes almost unto death. But he ever desired to suffer far more for the glory of his Lord. At Paris he was joined by nine companions from that University, men of different nations, who had taken their degrees in Art and Theology; and there at Montmartre he laid the first foundations of the Order, which he was later on to institute at Rome. He added to the three usual vows a fourth concerning the Missions, thus binding it closely to the Apostolic See. Paul III first welcomed and approved the Society, as did later other Pontiffs and the Council of Trent. Ignatius sent St. Francis Xavier to preach the Gospel in the Indies, and dispersed others of his children to spread the Christian faith in other parts of the world, thus declaring war against paganism, superstition, and heresy. This war he carried on with such success that it has always been the universal opinion, confirmed by the word of Pontiffs, that God raised up Ignatius and the Society founded by him to oppose Luther and the heretics of his time, as formerly he had raised up other holy men to oppose other heretics. Sed in primis inter catholicos instaurare pietatem curæ fuit. Templorum nitor, cathechismi tradition, concionum ac sacramentorum frequentia ab ipso incrementum accepere. Ipse apertis ubique locorum ad juventutem erudiendam in litteris ac pietate gymnasiis, erectis Romæ Germanorum collegio, male nuptarum et periclitantium puellarum cœnobiis, utrisque sexus tam orphanorum quam catechumenorum domibus, aliisque pietatis operibus, indefessus lucrandis Deo animis iustabat; auditus aliquando dicere, Si optio daretur, malle se beatitudinis incertum vivere, et interim Deo inservire, et proximorum saluti, quam certum ejusdem gloriæ statim mori. In dæmones mirum exercuit imperium. Vultum ejus cœlesti luce radiantem sanctus Philippus Nerius aliique conspexere. Denique ætatis anno sexagesimo quinto ad Domini sui amplexum, cujus majorem gloriam in ore semper habuerat, semper in omnibus quæsierat, emigravit. Quem Gregorius Decimus quintus, magnis in Ecclesiam meritis et miraculis illustrem, Sanctorum fastis adscripsit. He made the restoration of piety among Catholics his first care. He increased the beauty of the sacred buildings, the giving of catechetical instructions, the frequentation of sermons and of the Sacraments. He everywhere opened schools for the education of youth in piety and letters. He founded at Rome the German College, refuges for women of evil life, and for young girls who were in danger, houses for orphans and catechumens of both sexes, and many other pious works. He devoted himself unweariedly to gaining souls to God. Once he was heard saying, that if if he were given his choice, he would rather live uncertain of attaining the Beatific Vision, and in the meanwhile devote himself to the service of God and the salvation of his neighbor, than die at once certain of eternal glory. His power over the demons was wonderful. St. Philip Neri and others saw his countenance shining with heavenly light. At length in the sixty-fifth year of his age he passed to the embrace of his Lord, whose greater glory he had ever preached and ever sought in all things. He was celebrated for miracles and for his great services to the Church, and Gregory XV enrolled him amongst the Saints. This is the victory which overcometh the world, our faith. And thou didst prove this truth once more to the world, O thou great conqueror of the age in which the Son of God chose thee to raise up again his ensign that had been humbled before the standard of Babel. Against the ever-increasing battalions of the rebels thou didst long stand almost alone, leaving it to the God of armies to choose his own moment for engaging thee against Satan’s troops, as he chose his own for withdrawing thee from human warfare. If the world had then been told of thy designs, it would have laughed them to scorn; yet now, no one can deny that it was a decisive moment in the history of the world when, with as much confidence as the most illustrious general concentrating his forces, thou gavest the word to thy nine companions to proceed three and three to the holy City. What great results were obtained in the fifteen years during which this little troops, recruited by the Holy Ghost, had thee for its first General! Heresy was trampled out of Italy, confounded at Trent, checked everywhere, paralyzed in its very center; immense conquests were made in new worlds, as a compensation for the losses suffered in our West; Sion herself, renewing the beauty of her youth, saw her people and her pastors raised up again, and her sons receiving an education befitting their heavenly destiny; in a word, all along the line, where he had rashly cried victory, Satan was now howling, overcome once more by the name of Jesus, which makes every knee to bow, in heaven, on earth, and in hell! Hadst thou ever, O Ignatius, gained such glory as this in the armies of earthly kings? From the throne thou hast won by so many valiant deeds, watch over the fruits of thy words, and prove thyself always God’s soldier. In the midst of the contradictions which are never wanting to them, uphold thy sons in their position of honor and prowess which makes them the vanguard of the Church. May they be faithful to the spirit of their glorious Father, “having unceasingly before their eyes: first, God; next, as the way leading to Him, the form of their institute, consecrating all their powers to attain this end marked out for them by God; yet each following the measure of grace he has received from the Holy Ghost, and particular degree of his vocation:” Lastly, O head of such a noble lineage, extend thy love to all religious families whose lot in these times of persecution is so closely allied with that of thine own sons; bless, especially, the monastic Order whose ancient branches overshadowed thy first steps in the perfect life, and the birth of that illustrious Society which will be thy everlasting crown in heaven. Have pity on France, on Paris, whose University furnished thee with foundations for the strong, unshaken building raised by thee to the glory of the Most High. May every Christian learn of thee to fight for the Lord, and never to betray his standard; may all men, under thy guidance, return to God, their beginning and their end.